For many seniors who are worried about falling in their homes, medical alert systems can provide some protection and peace of mind. However, as it is with many alert or alarm systems, there seems to be too many types to choose from and the product brochures may be full of marketing hype. Below are links to two articles which offer a detailed and impartial guide to medical alert systems. 7 Numbers Every Senior Needs! 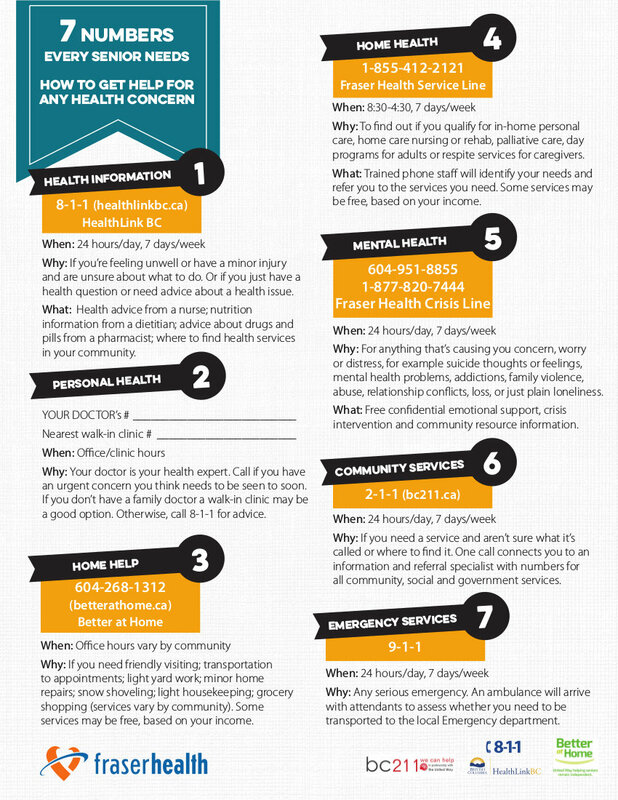 There is a very useful article that appeared on the October 2015 news section of the Fraser Health website on important numbers for seniors to have. The poster from the article is reproduced below. The Office of the Seniors Advocate of BC has released the results of a province-wide survey of almost 7,500 HandyDART users. 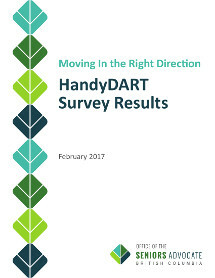 The report “Moving In The Right Direction - HandyDART Survey Results" can be found at its website. Having problems trying to register online for the City of Burnaby's programs and activities using WebReg? The "How To" document below may be able to help you understand the registration process better. View/Download WebReg Registration How To. BC Centre For Elder Advocacy and Burnaby Community Services offer are offering a free legal clinic for low-income seniors in Burnaby. A lawyer from the centre will be there to answer legal questions and draft advance planning documents such as wills, enduring powers of attorney and representation agreements for those who cannot otherwise afford legal assistance. The clinic is held on the third Tuesday of every month 2-4pm. The first hour of each clinic will be for appointments, the second hour for drop-ins. 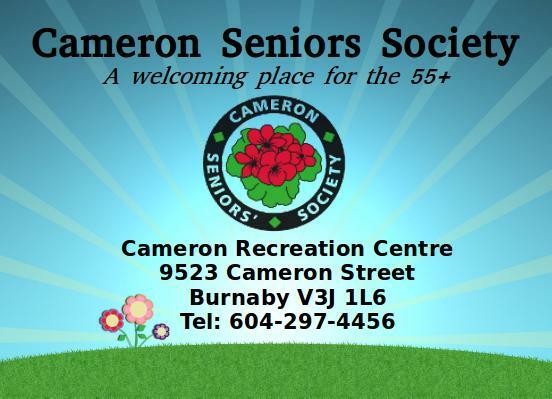 For appointments call M.J. Buck of Burnaby Community Services 604-292-3902 - Ask to see a lawyer at the seniors' legal clinic. View the BurnabyNow newspaper article about this service.